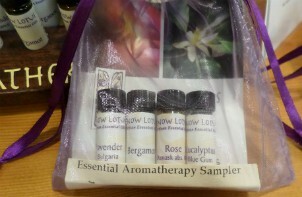 Our favorite line of essential oils: Snow Lotus Essential Oils. Our fabulous acupuncturist Timber Hart, LAc, introduced Wellspring Centre for Body Balance to the Snow Lotus brand. The plant material used in the production of these oils is all certified organic, and the oils are produced using steam distillation rather than chemical extraction, making Snow Lotus brand one of the purest essential oil options out there. While we never recommend taking essential oils internally, folks who do should always use the purest options available to avoid getting anything in their system besides the oil. Another great feature of these oils is that they are incredibly affordable. One bottle sells for only $20, and we also offer sampler bags including four different 4mL oil testers for only $25. We have several blends, including ImmuneStim, DigestEase and StressRelease, as well as single oils including Bergamot, Frankinsence, and that old standby Lavender, which we carry regularly. 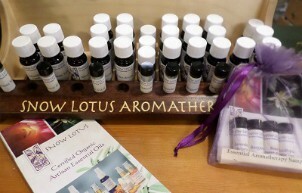 We’re also happy to special-order any oils in the Snow Lotus line that you’d be interested in trying. Our front desk goddess, Lo, is a huge fan of essential oils and will be happy to talk to you when you come in to the office about which oils she uses, why and how. We always recommend that you dilute oils in a water spray or carrier oil, or if applying oils straight, that you begin with a spot-test to make sure that this powerful plant medicine won’t irritate your skin. Scent is a powerful force in the brain. We can all remember a time when a particular smell associated with a specific time in our lives has taken us right back to that time in our mind. With essential oils, we can use the power of fragrance to change our mental state, and the powerful medicine of essential oils can have systemic effects when applied topically.